A class TEM-TMH heavy switcher. They look like brand new, which they are too, but built on old Russian TEM18 locomotives. The undercarriage is from an old locomotive, all the rest is rebuilt new. 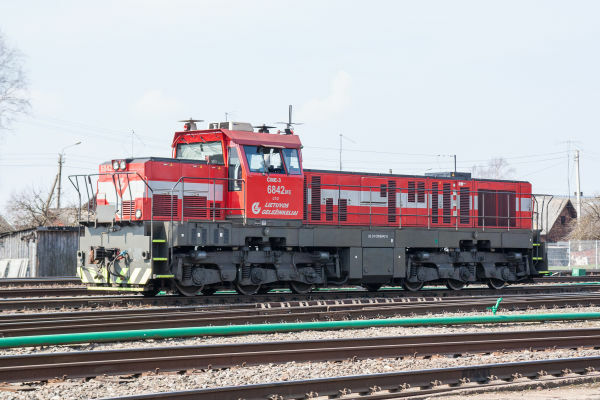 Lithuanian state railways LG now has 61 of these new shunters. Picture in Šeštokai 2.4.2017 by Ilkka Siissalo. 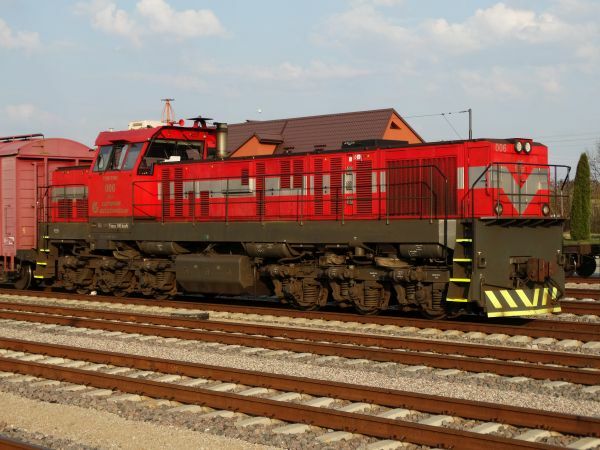 Although the new TEM-TMH locomotive is primarily a heavy duty switcher, they are also used in main line duty and sometimes in multiple. In this case a triple pack was just about to pick up an extremely heavy coal train. Picture from Jonava station 26.6.2015 by Ilkka Siissalo. 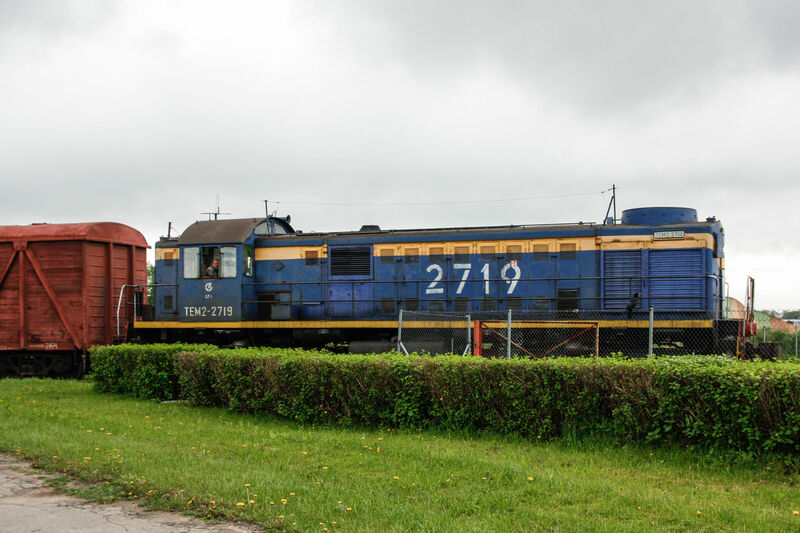 Another TEM-TMH at Marijampole station 26.6.2015. 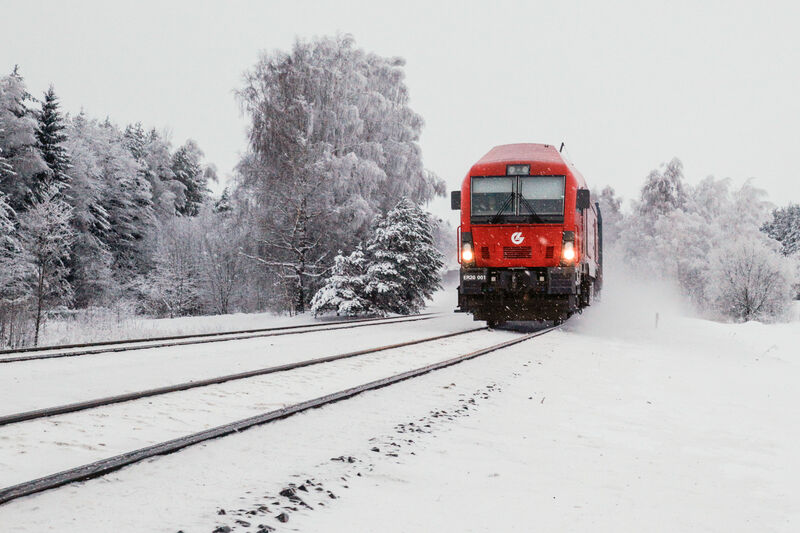 Picture by Ilkka Siissalo. This one VERY much looks like a similar TEM-TMH like the ones pictured above, but it's not. 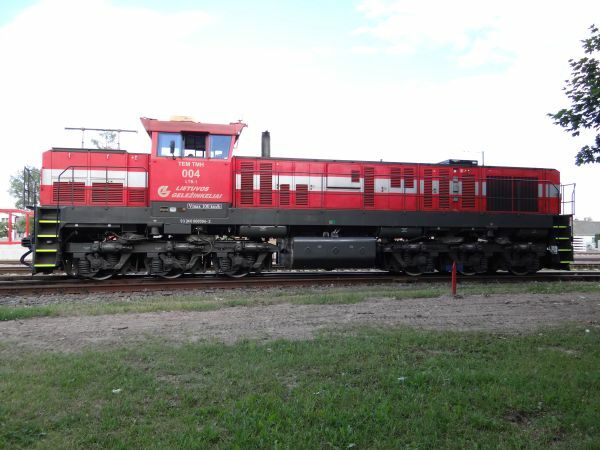 You have to look really carefully to see differences for example in the undercarriage structures to see that it is a totally refurbished heavy shunter of the class ČME3M, built originally in 1964 and then totally rebuilt in 2008. LG has 23 of these rebuilt ČME3 units. The M at the end of ČME3M stands for modernised. Picture in Radviliskis 24.4.2011 by Kyösti Isosaari. 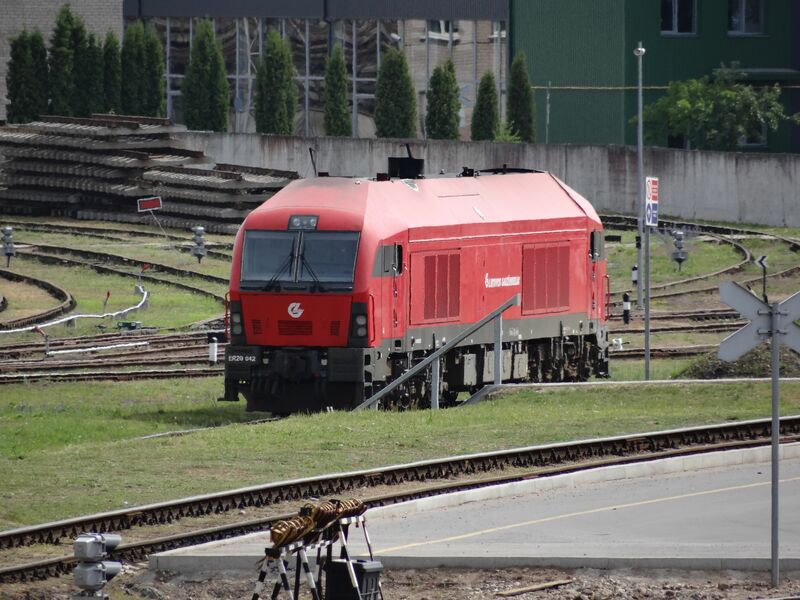 The ER20 is Lithuania's only modern and strong main line cargo locomotive. The model is made by Siemens and it is based on the Austrian class 2016, which is often also called ER20. But in contrast with the Austrian machines, these Lithuanian ones have six axles and a modified front which - as you can see - resembles Siemens' Vectron locomotives. LG uses these machines especially in the Russian corridoor traffic between the Russian enclave of Kaliningrad and mainland Russia. 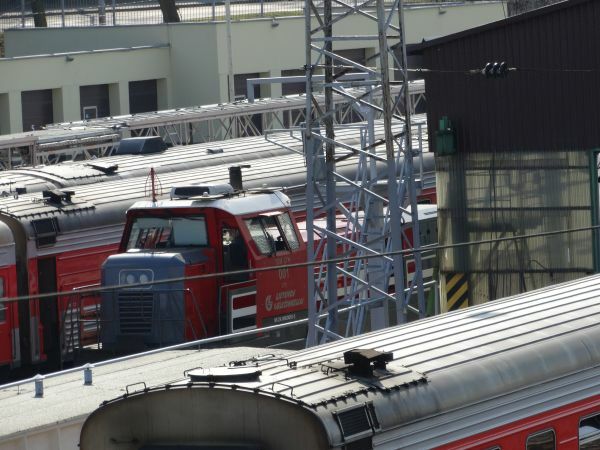 Just like with the Austrian machines, also these locomotives are ofter referred to by the nickname "Hercules", which Austrian ÖBB gave to its ER20s. 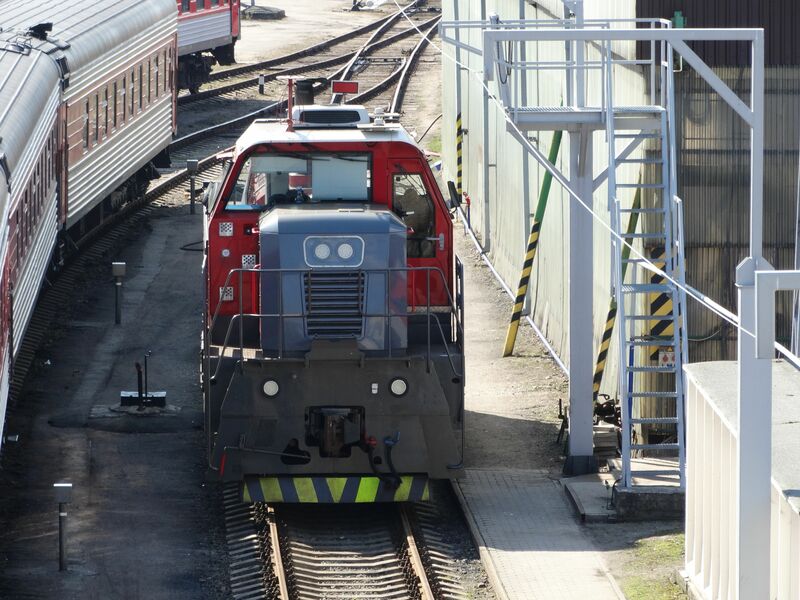 Picture of an ER20 in Kaunas 26.6.2015 by Ilkka Siissalo. ER20 no.001 in full speed, leading a cargo train in Pakirsinys. Picture 28.12.2010 by Kyösti Isosaari. 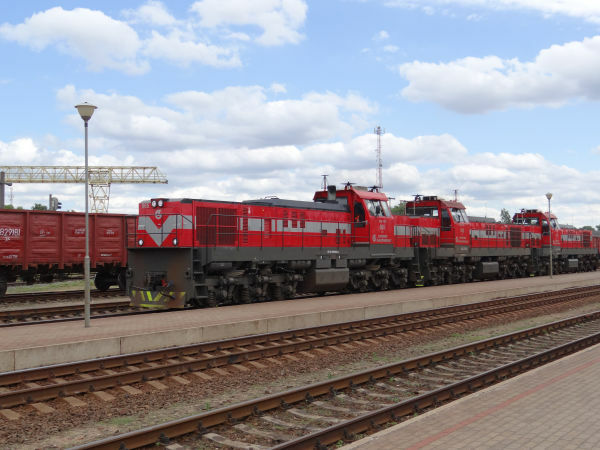 Again the same ER20 "Hercules" no.001 as in the picture above, but now at the depot of Radviliskis with three 2M62 / 2M62K locomotives. Picture 28.12.2010 in Radviliskis by Kyösti Isosaari. Another ER20 Hercules, here in full speed pulling a long train of car transportation coaches. Picture in Jūré 28.6.2013 by Ilkka Siissalo. 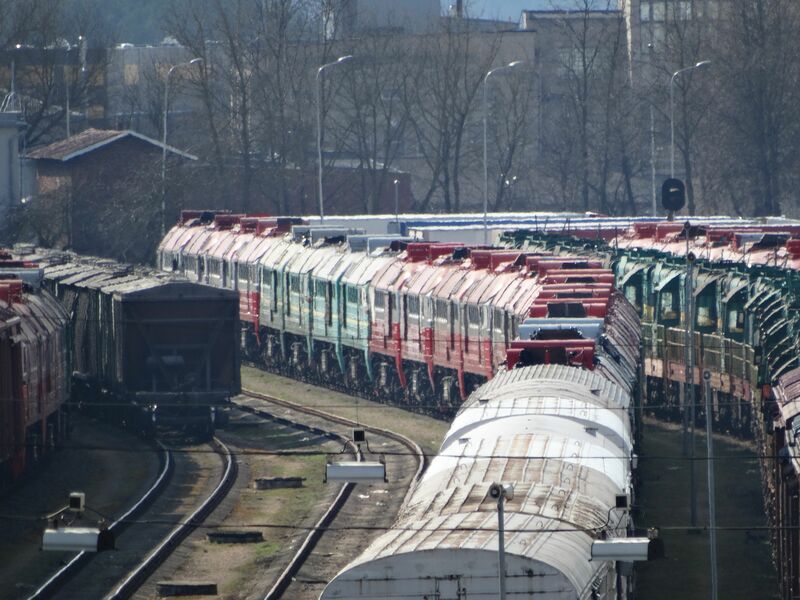 A really good side view of the ER20 no.001 which clearly shows how huge the Lithuanian 6-axle ER20s are. Picture 28.12.2010 in Radviliskis by Kyösti Isosaari. 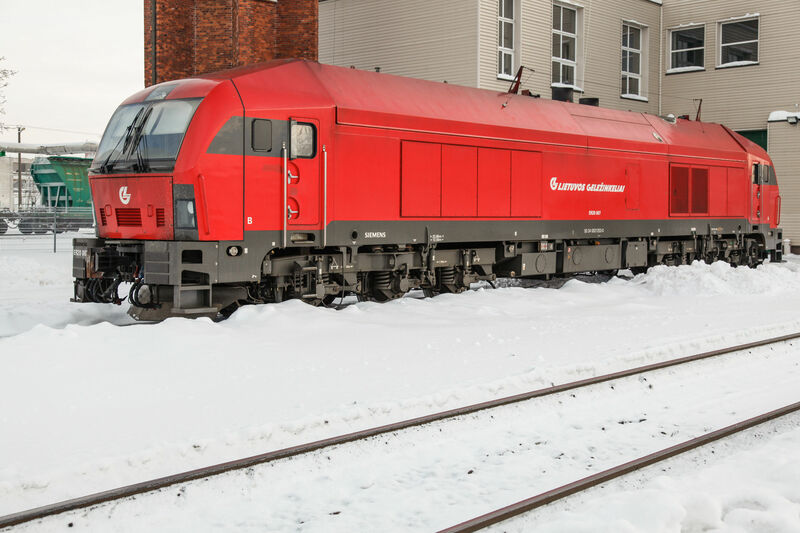 For comparison: This is the original Siemens' ER20 as designed for Austrian ÖBB and as then later sold to many other companies, especially in Germany. 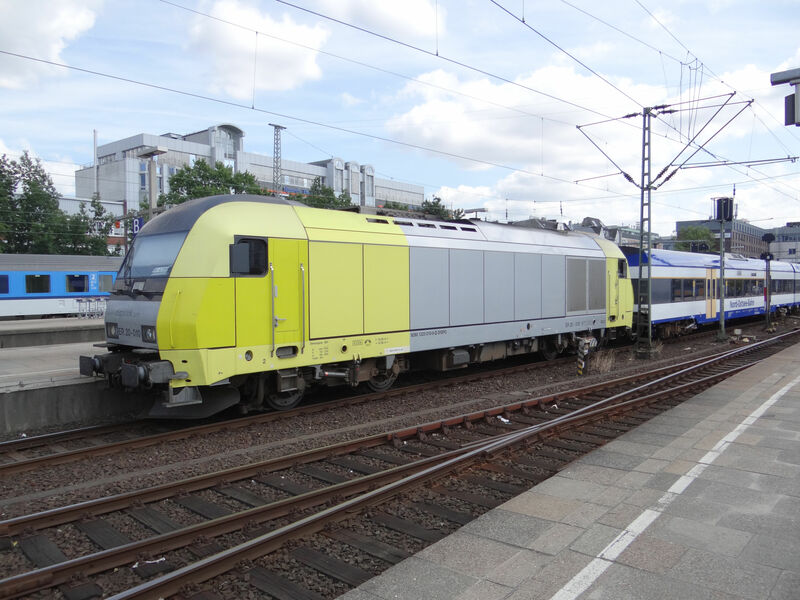 This one is painted in the yellow and silver colours of the former leasing company Siemens Dispolok, later MRCE leasing. As you can see, it is by far smaller than its Lithuanian counterpart. 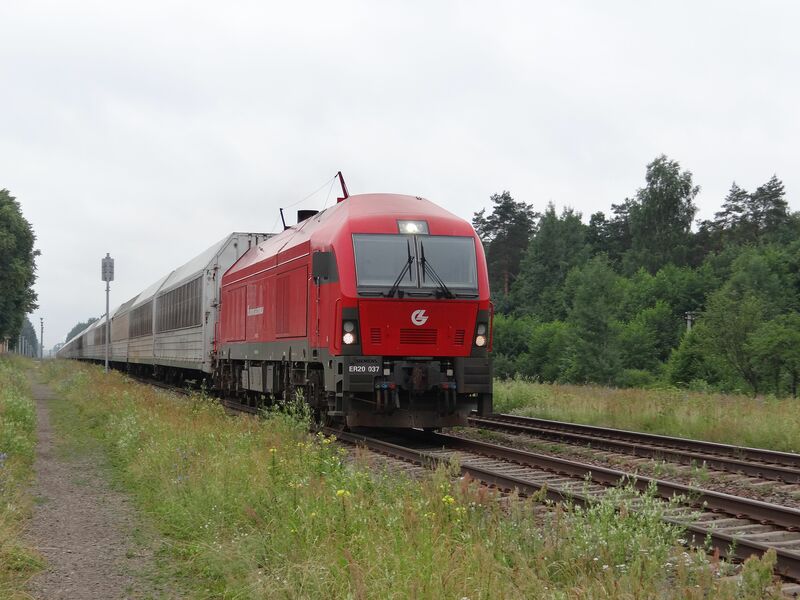 Picture from Hamburg Altona station in Germany 8.7.2013 by Ilkka Siissalo. 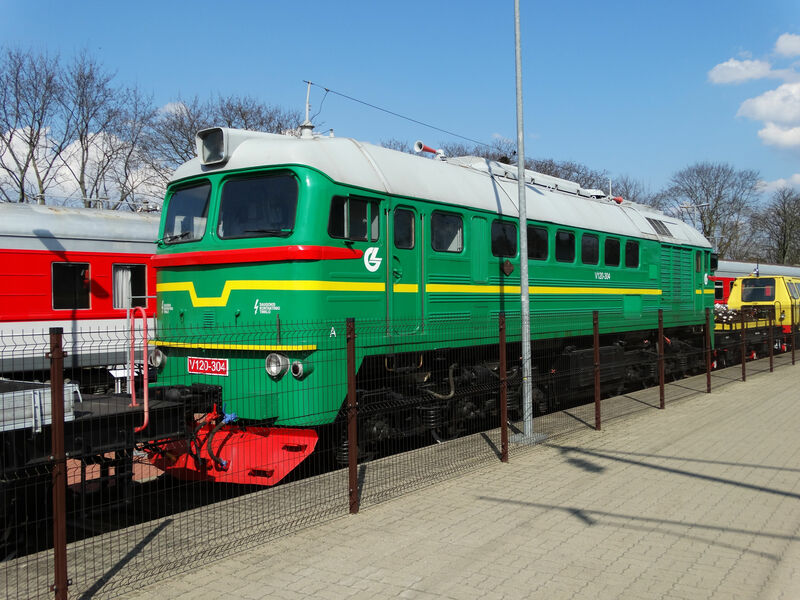 Lithuanian railways are now replacing and pushing aside many of the old Soviet time locomotives and trains. These long lines of Soviet Russian old M62, 2M62, 2M62U and ChME3 (ČME3) locomotives wait for their fate at the Vilnius depot. Picture from Vilnius 2.4.2017 by Ilkka Siissalo. This is not a good picture, because the locomotive was so well hidden. But it's still worth showing. It is the one and only of its kind, class TEM-LTH. Look at the register number at the side: "98 24 000000 1-3". 98 tells the country, 24 that it is a diesel, six times zero is where the locomotive class number should be, and then number 1. -3 is just a control character. This class "000000" no "1" spooky machine is built by Bryansk Locomotive Works of Transmashholding and CZ Loko of Czech republic. 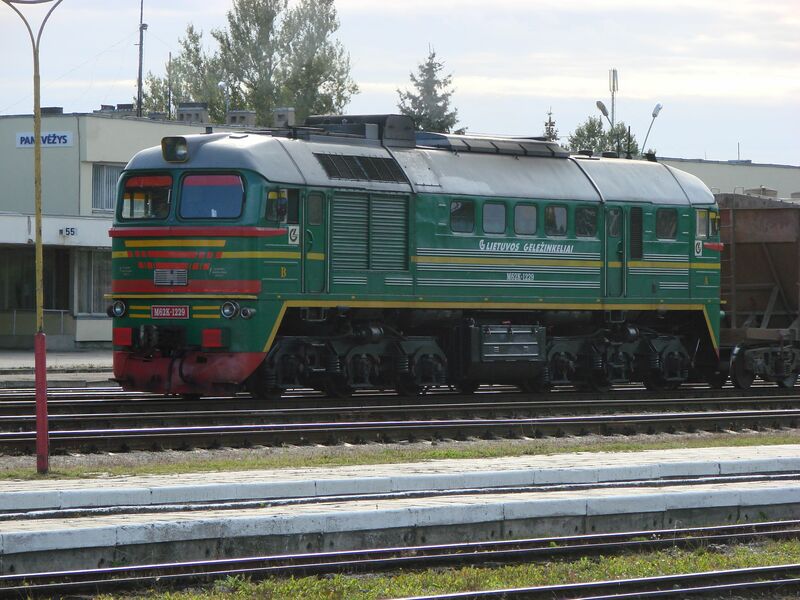 The undercarriage is the same as in previous machines of the Russian class TEM103, but everything else is designed brand new. The engine comes from Caterpillar. Picture from Vilnius 2.4.2017 by Ilkka Siissalo. The same TEM-LTH as above, but seen from the front. Picture from Vilnius 2.4.2017 by Ilkka Siissalo. At the Vilnius rail museum by the railway station one of the old M62 locomoives is displayed. It is painted approximately to the old Soviet time colours (not quite though), but what I don't understand is why it has been labeled V120 instead of M62. 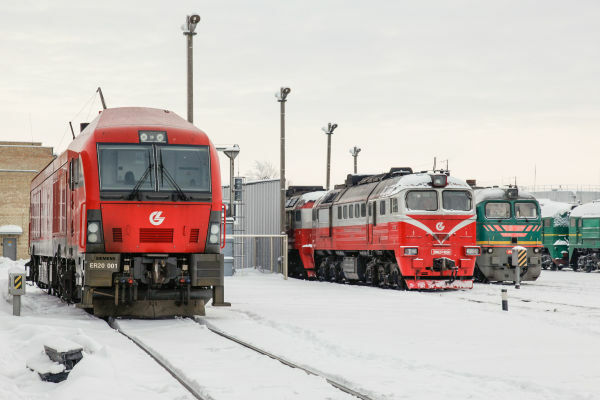 As long as these locomotives have been operational in Lithuania, they have always been called M62 accrding to the Russian and before that, Hungarian standard. It was East Germany, DDR which first classified these same machines as V200 and later as Baureihe 120. The name "V120" does not even fit the old DDR. This picture is from a railway museum by the station of Vilnius, Lithuania, and as it is a museum, we do not understand the labeling which has actually never been in real use. Same goes with the Br 52 German Kiegslokomotive, which was on display at the same place. The Germans called it Baureihe 52 or Br52 and Russians called it either class 52 or class TE. Now in this museum it is labeled TE 52, something that never existed in real life. Oh well... reinventing history is nothing new in Soviet Union... Picture from Vilnius 2.4.2017 by Ilkka Siissalo. 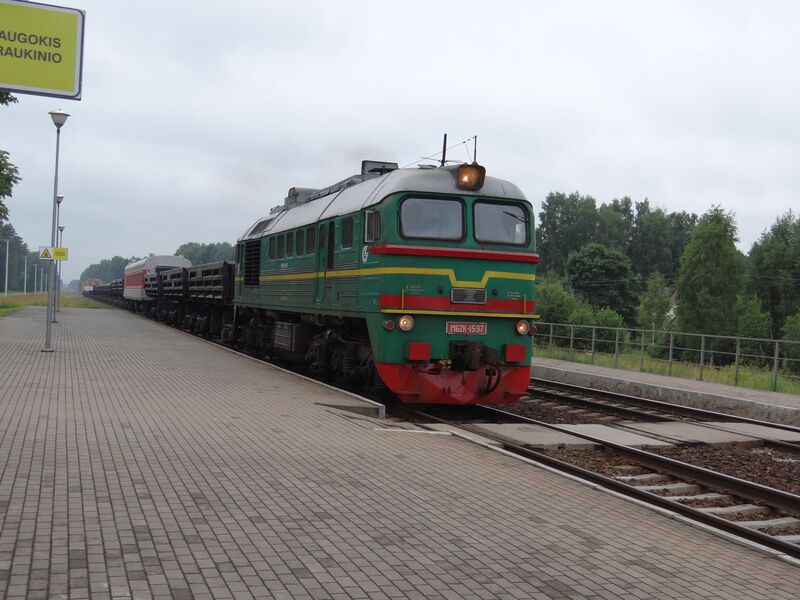 The huge 2M62 double locomotive, once commonplace, is now quickly vanishing from Lithuanian railways. According to Wikipedia LG still has 74 of them plus 22 of the updated version 2M62U. Some years back they were all dark green as in the Soviet Union the practise was, but this one has already been repainted to LG's colouring scheme. 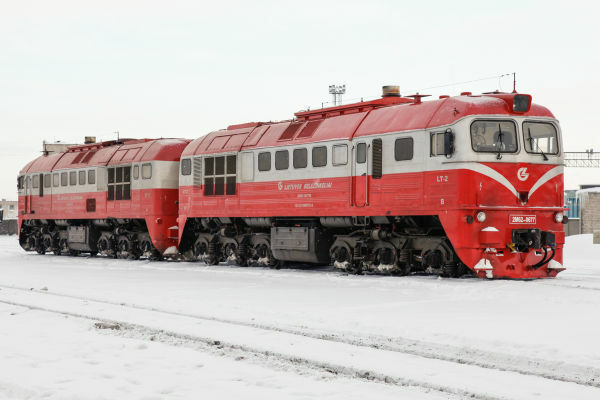 These were built in 1976 at Voroshilovgrad in USSR. Picture in Radviliskis 28.12.2010 by Kyösti Isosaari. These old Soviet locomotives of the M62 family in the old green Soviet time paintings were still a couple of years ago the absolutely most common sight on Lithuanian rails, but now they are getting rare. The few ones still in use have often been repainted, remotorised, or both. This one is an M62K (remotorised version) pulling a train with new rails and sleepers. Picture in Jūré 28.6.2013 by Ilkka Siissalo. Another M62K in Panevėžys pulling a grain train in 2007. In those days almost all the operational locomotives in the country were still of the M62 family. Picture 16.9.2007 in Panevėžys by Sanna Siissalo. An old class TEM2 diesel shunter, still in the Soviet railways typical paintings and with an old Soviet Russian cargo wagon. Picture in Kaunas 15.5.2010 by Kyösti Isosaari.